With her witch’s black hat, walking stick and purse; this witch is surrounded by a flock of doves. 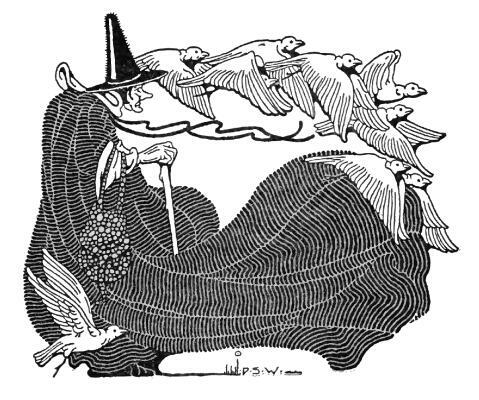 This free witch image is intriguing for the contrast between the evil witch (the original story had her being not very nice) and the implied peace of the flying doves. Her flowing cape adds a bit of beauty to her hunched form. Clever crafters could easily use this vintage black and white image for halloween and a myriad of other uses. Copyright free and downloadable. This is just one of several wonderful black and white drawings from the talented artist Dugald Stewart Walker (1883-1937) included in the book The Boy Who Knew What the Birds Said. It was released in 1918.